Forget Skincare; Copper, biotin, phosphorus, magnesium, vitamin B6 and omega-3 fatty acids, A, K, E and B vitamins, potassium, folate, and fiber in a tasty smoothie full of vitamins which boosts your skin is the new way to go in 2017. No kidding, you can have a delicious, tasty, tremendous smoothie with all those nutrients, and no, you do not need to crush a bunch of pills to do so. Now if you really want to look and feel younger, and you want to achieve it in a short time, then you must drink this smoothie designed to improve the appearance of your skin. It´s not a secret that many of the treatments offered in beauty salons are not only expensive they also fail to give you effective results. So, with this Super-High-Vitaminized Smoothie, you’ll say goodbye to wrinkles and lines of expression that appear in different parts of your body and you won´t need to worry. 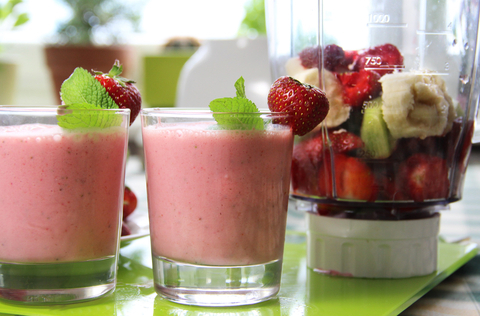 This smoothie is designed to give you a VITAL VITAMIN BOOSTER for your skin. Remember that among the most recommended foods to rejuvenate are Kiwis, Strawberries, and other high containing vitamin C fruits such as Oranges and Mandarins. Therefore, a diet rich in these fruits will make your skin to stay young longer. In the case of kiwifruit, it is so beneficial that with only a portion of this fruit all mornings will help your health because among the properties of this fruit, one is that can reinforce your Immune system, which promotes stress reduction as well as better digestion, not only that, is also good for blood circulation. So taking all that into consideration, and actually visiting one of my favorites Juice Bars at Bryant Park, New York I designed one of my favorite smoothies: I called it the Ultra Vitamin Drinkable Tidbit . It contains Strawberry, Kiwi and Mandarin juice (all organics if possible) a recipe that I can say gives to me tremendous results and I know will do the same for you. 3 Units of peeled and chopped Kiwis, ½ Cup of chopped Strawberries, ½ Glass of Mandarin juice and 1 Cup of ice. Blend them all and enjoy. You can have one of this 15 minutes before starting your exercise routine, the difference in the amount of energy will be incredible and on the way how you´ll look if you are consistent with a balanced diet. Remember copper plays a role in energy production; biotin is needed for healthy metabolic, nerve, digestive and cardiovascular functions; phosphorus helps to keep your bones and teeth strong; magnesium promotes detoxification and energy production; vitamin B6 and omega-3 fatty acids promote cognitive abilities; A, K, E and B vitamins are just essential to support life as well as potassium, folate, and fiber are needed to stay healthy. Boost your skin in 5 days!